My fellow bloggers and I go to great lengths to find rare brew and exceptional spirits but sometimes a simple Corona, an amazing sunset, and outstanding Mexican fusion cuisine is all I need to take me to my happy place. 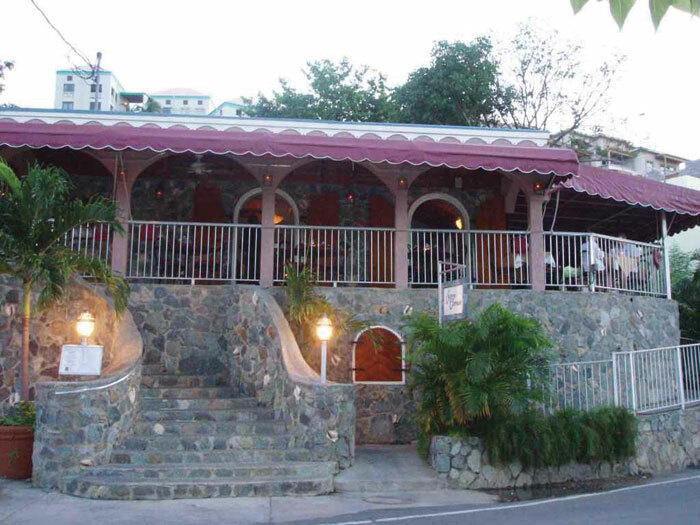 Such was the case the other day while dining at Cactus on the Blue in Cruz Bay, St. John U.S.V.I..
Before I recount this outstanding meal let me answer one question: YES — Just about everything is better when you are in beautiful St. John! The food at Cactus on the Blue was more than just good food in a great location. It was great food to match a great location. For our meal I went with the Spicy Chipotle Mahi Wrap and the wife had the Mahi Mahi Fish Tacos. Both were excellent. The Chipotle Wrap was a wonderful balance between sweet and heat with the smoky spice of the chipotle sauce played off the fruity crunch of the pineapple salsa in the wrap. For the tacos they were light topped with a delightful Baja slaw and tangy aioli. Normally I avoid light flavored brew and any brew with fruit in it but an ice cold Corona with lime was perfect to pair with this meal. Better than a Margarita that would have its ice quickly killed by the heat. Just enough refreshment to cut the heat and the spice but nothing to overpower the delicate flavors. If you are ever in St John, I highly recommend you check out Cactus on the Blue. They are a bit out of the center of “Town” but worth the walk. From the ferry dock walk through Wharfside Village and they are just on the other side. Parents note: Cactus on the Blue has a full kids menu (Tacos, Chicken Tenders, etc..). My girls loved the food and the the view of Cruz Bay. How About Some Knob Creek Bourbon Caramel Sauce For Dessert? This sounds like a fabulous spot! Gotta love well made and delicious Mexican food. And as far as the Corona goes, as long as it’s hot enough (the weather) and cold enough (the beer), then I am more than fine with it. And if I happen to be by the ocean (yes, I know that I’m water challenged, but I do love the look and sounds of the ocean), then it’s a perfect combination. More posts to come from the islands …..